It’s National Beer Day this Saturday, April 7th! 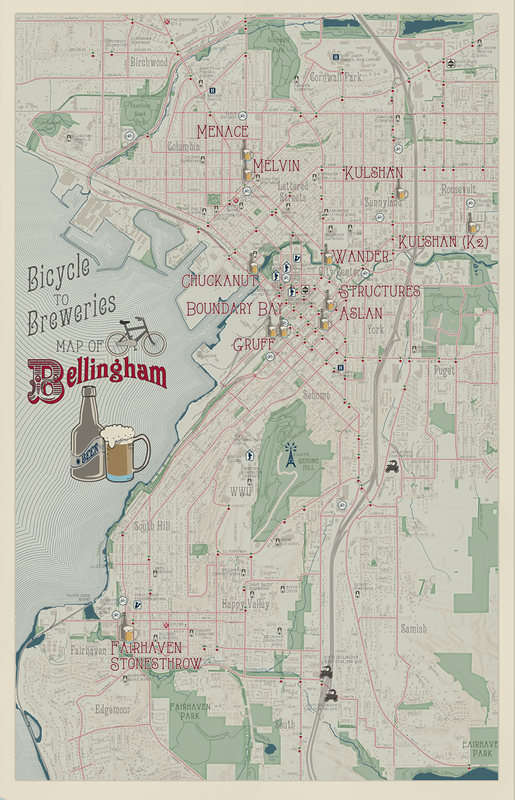 I’m celebrating by posting this Bicycle to Breweries Map of Bellingham, my home city. National Beer Day is a great excuse to share this map, but I should probably give at least a brief description of the map. The map shows the location of the city’s breweries and bike shops nearby. I made it using the ArcGIS Maps for Adobe Creative Cloud extension, and its entire dataset comes from the City of Bellingham’s open data. The streets marked with a red dash are all part of Bellingham’s Pedestrian Master Plan, which is an ambitious infrastructure program to improve the City’s walkability. Bellingham is already wonderful place to walk and bike, rain or shine. The city has great trails, great breweries, and a lot of cyclists, walkers, and runners. With late night sunsets approaching, the season for riding bikes to neighborhood breweries is coming soon. I started this map as a tutorial to show fellow mappers how to make a map using this particular Adobe Illustrator extension, made by Esri (I’m on that team!). One of the features in the extension’s latest updates is the ability to pick from standard layout sizes for print, mobile, and other common media formats. This map uses the 11×17-inch tabloid format. I am going to file this map into the permanently unfinished category. However, it will certainly help you find the Bellingham breweries, most bike shops, park-and-rides, all traffic lights and trails that were in existence during the time the data was created. It also was a fun exercise in creating a Victorian-esque Adobe Illustrator symbol set.